I struggle to find the right words to begin this letter to you. My husband has been made active on the national lung transplant waiting list and as his health declines, I think of you often. Since October of 2012, long before transplant was a thought in my mind, I felt the Lord calling me to pray for you, my husband’s one-day hero and donor. Since that time I have prayed for you often. I pray first and foremost that you would know Jesus Christ as your Lord and Savior, and if you don’t, I ask God to place people into your life that will share Him with you. God loves you overwhelmingly, and I hope you do not leave this earth without having experienced that love, and the power of His forgiveness in your life. I also pray for your relationships. Where there are hurts, I pray forgiveness and healing. Where relationships have been broken, I pray restoration. For those positive relationships in your life, I pray abundant blessings. I hope you will say all the things you feel in your heart. Let your loved ones know how much you love them. Hug them, kiss them, and spend quality time with them. Give them joyful memories to hold onto and help them through hard times when they are missing you. I want you to know that I do not take lightly this gift you are giving to my husband, and in turn, our family. In order for him to breathe easily again, I know it means you will have paid the ultimate price, and therefore, I’m hesitant to wish transplant would come soon. Instead, I place the timing of it into God’s hands, and ask for His angels to be with you when the end is near. When your gift of lungs, and to breathe again, has been given, I will be forever grateful! I pray that my husband’s body would accept them as his own, and that God would use them to bring lifelong healing to his body. I will do what I can to ensure they are treated well and protected for the irreplaceable gift they are. Finally, I want you to know that as I have prayed for you, I will continue to pray for your loved ones when you are gone. My heart hurts for the pain and grief I know they will experience, and I wish it didn’t have to be this way. I hope that they will take comfort in knowing that your death was not in vain, and that you have given life to at least one other (and probably even more). Until that time comes, live life to the fullest. Go and do the things you’ve always wanted to do or try. Take a walk in a park, plan a picnic, eat foods you’ve never tasted, dance; don’t be a wallflower, turn off social media, love hard, enjoy life and LIVE! Live like there’s no tomorrow, because one day soon, there will be no more tomorrows. Thank you, from the bottom of my heart for the gift you’re about to give. I hope one day I will be able to meet you in our eternal home and tell you about the difference you made in my family’s life. For now, inhale, exhale, breathe easily, and LIVE! You just gave me chills. You are a gifted writer. My prayers are with you all. Happy Easter. That is an amazing letter, Tiffany. I am, as always, praying for all of you. I know that God’s hand is upon you and your family. So incredibly touching, Tiff! Thank you for sharing – and I think you can count on more of us joining you in praying for the donor and their loved ones! You continue to be a real blessing as well as a challenge to me as you let us see into your life and your heart! I love you! What a beautiful letter! Brought tears from the first sentence. So heartfelt. Thanks for sharing it. Yes, tears here too. I am a donor. I will join you in praying for this special person. Thank you, Tiffany…for sharing your heart and for challenging us to be aware of the gift of life that each one of us should be living as fully as possible. You have certainly reminded me of how precious life is and how important it is to live and love with no holding back. Like you, each of us has a story that results in God’s leading to pray for someone else. For several years now, I have been praying every time I hear a siren…for the first responders, the victims and their families. Thank you for sharing how your story will bless others by intervening in prayer for them. Your journey has been inspiring. Through your pain, you have revealed a depth of love that some people never obtain. Keep writing. We will keep lifting Jody, your family, and the donor up in prayer. God’s timing is perfect. As always, thanks for reading Pam, and for the kind comment. You’re always an encouragement. 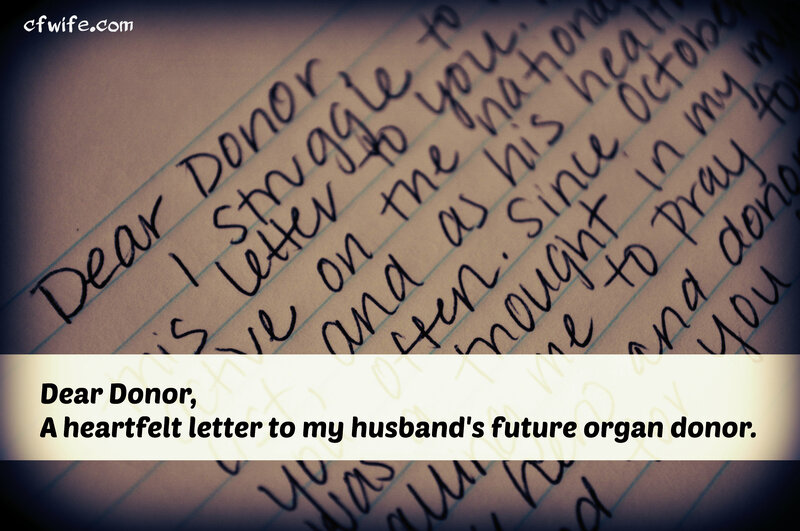 Tiffany, I want to let you know that I have been a donor for many, many years. Love, Mom PS: well written letter. I always enjoy reading your blogs. You have a way with words and present it so all can understand. Maybe this is your secret ambition??? Ha Ha! When you first told me that you started praying for the donor, I was really moved that your heart was so focused not only on what you stand to gain, but concerned about what someone else is losing. But reading this I was blown away by the depth and specific requests in your prayers. Thank you for sharing.